Red Hood: Outlaw #30 review: Great art can't save a slow, uneventful story – AiPT! Red Hood comes face to face to with the Underlife…and it’s somehow uneventful. His best friend murdered. His teammates vanquished to an unknown plane of existence. Exiled from Gotham City, his home. It’s been a rough go for Jason Todd a.k.a. the Red Hood as of late. At least with this week’s Red Hood: Outlaw #30, Jason is on the verge of eliminating the remaining remnants of the vicious Underlife crime syndicate, a crusade he undertook with his recently deceased best friend Arsenal. 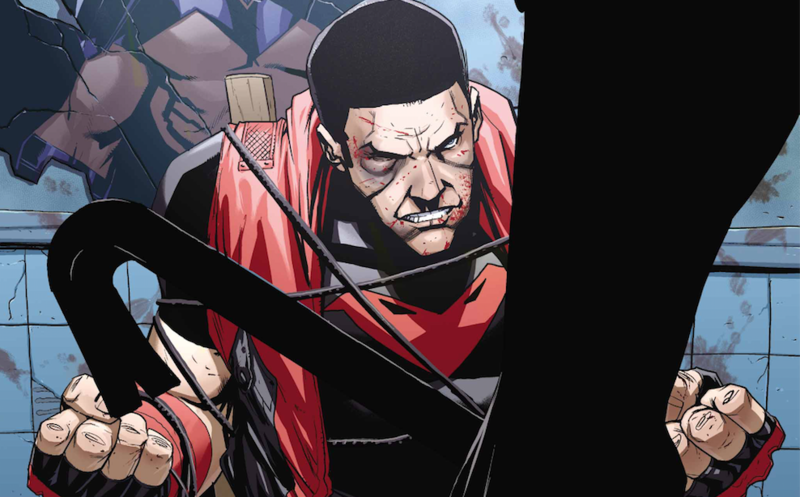 Jason Todd finishing an emotionally driven crusade against a savage gang — sounds pretty awesome, right? Well, unfortunately the actual issue fails to deliver any awesomeness whatsoever. While Red Hood: Outlaw #30 boasts some pretty fantastic artwork from artist Pete Woods and colorist Rex Lokus, the story the art is presenting is slow, uneventful, sporadic, and utterly anti-climactic. If it weren’t for the (mostly) intricately detailed panels and drab, shadowy colors employed by Woods and Lokus, Red Hood: Outlaw #30 would have nothing going for it. While the utter lack of conflict makes for an underwhelming narrative, it does provide an opportunity for Woods to really show off his expertise at character modeling and constructing detailed environments. While there are a few frustratingly bland panels lacking any sort of background or detail aside from characters, most of Woods’ work here is wonderful and helps present a gritty, mysterious feel to the issue. It’s the colors from Rex Lokus that really give this book it’s feeling and tone, however. The issue is filled almost entirely with a drab color palette that gives the whole story a noir-mystery feel, while the overwhelming use of dark shadows throughout cements an overwhelming feeling of mystery and looming conflict. Lokus’s work particularly shines towards the end, as Jason searches through an eerily abandoned outpost that may not be so empty after all. Aside from the art of Woods and Lokus, there’s nothing really positive to say about this issue. It’s a narrative bore that somehow manages to stuff too many flashbacks and too many teases for future issues into one story simultaneously. Rather than focus on what is currently happening, it seems writer Scott Lobdell would rather tell readers what has happened and hint at what is going to happen. Wingman’s appearance and capture of Jason Todd serves no purpose to the current narrative, but it does disrupt an already dull story to tease a possible heroes return to Gotham City in the near future. While this certainly sounds like an interesting direction for this series to go in, it’d be better if the narrative that is unfolding now was more intriguing. Jason’s inexplicable escape from Wingman’s clutches just makes the entire sequence feel all the more unnecessary. Another such tease, one that is sure to excite many fans (including me), feels equally interruptive and just as unnecessary as the Wingman scene- the glimpse at Bizarro and Artemis. It’s safe to say that most readers, whether they’re enjoying Outlaw or not, want to see Jason reunite with the outlaws. That being said, the appearance of Jason’s former teammates serve no purpose in this issue. Instead, their inclusion feels like a random interjection meant to remind readers that their return is on the horizon. Once again, this sounds like a great direction for the series but does nothing for the narrative unfolding in the issue. For all the tension and sense of impending confrontation cultivated by Woods and Lokus, this issue concludes in a surprisingly dull fashion. Jason sort of wanders through an abandoned stronghold and stumbles upon all sorts of illegal things before suddenly coming face to face with the mysterious villain, Solitary. It’s a very uneventful inaugural meeting between the protagonist and a villain who’s been teased for almost a year now that feels like an utter letdown. Solitary just sort of appears with no real surprise or reaction from Jason. Despite how unfortunately slow and uneventful this issue is, Lobdell and company make it clear they have big plans for this series in the future — and everything they tease has the potential to be great. It’s just a shame so much of this issue is spent teasing what’s to come rather than focus on the present. Pete Woods and Rex Lokus' art does a fantastic job crafting a genuine sense of suspense and tension, however the ensuing narrative spends more time teasing what is to come instead of focusing on the current story. The lack of action really allows Pete Woods' art to stand out, especially his character models and environments. Rex Lokus's use of drab colors and persistent shadows creates a genuine sense of tension and looming surprise. It's clear that writer Scott Lobdell has big, exciting plans for this series moving forward. The issue spends more time foreshadowing what's to come rather than telling an interesting story now. Wingman's capture of Jason Todd and the quick re-appearance of Artemis and Bizarro serve no purpose aside from teasing what is to come, interrupting the already slow narrative. The story is very slow and largely uneventful. Solitary and Jason's first meeting is anticlimactic and bland, feeling like a let down for a villain that has been teased for so long.